The Nikko Blue Hydrangea Shrub is a superb blue flowering shrub for accent or border use in semi-shaded areas. Hydrangea Nikko Blue is a Mophead Hydrangea (Hydrangea macrophylla) or, also referred to as French Hydrangea and is adored for its beautifully, blue flowering clusters. Hydrangea Nikko Blue displays handsome foliage on a boldly branched, mounded form. This popular flowering shrub hydrangea grows in partial sun, and is fast-growing to 4 to 6 feet high, equal width. Nikko Blue Hydrangea is one of our best selling flowering shrubs. 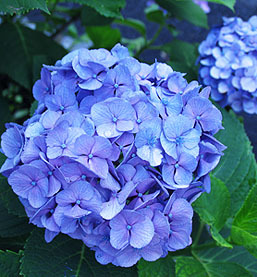 Few flowering shrub plants offer such beautiful Dutch blue coloring blossoms as hydrangeas when grown in acidic soils. This variety is perfect for cool colored garden themes featuring purple, pink and white. Nikko Blue is gorgeous as an accent with lighter greens or when planted in a mass to intensify the impact of these flowers in large spaces and large enough to provide reliable foundation planting along walls, fences or as partitions and screens. Blue Hydrangeas once the plant of choice for flowering shrubs is now making a comeback with the younger generation. Hydrangeas continue to be among the showiest of summer and autumn flowering woody plants. They are shade tolerant and grow well on the shady side of a building or under trees. Planted as specimens, or massed together for stunning borders. The dried flower heads are often used in flower arrangements. These hydrangeas are well-established, blooming-size.